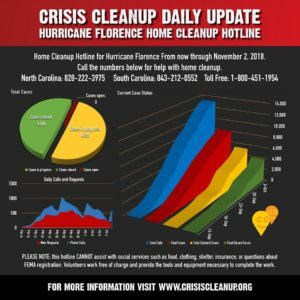 Volunteers are in NC to help clean houses! Tell your neighbors, tell your friends, tell your family — REGISTER FOR VOLUNTEERS TO HELP by calling the cleanup HOTLINE!!! Registering with FEMA is only PART of the the answer to help after a hurricane. Getting homes cleaned out, debris removed, and mold gone is the next most important step for saving a dwelling. Volunteers come in droves to help with this, and how do they know where to go? Vetted volunteer groups are the only ones allowed access to this information, so the people coming to help you are real, compassionate, and working to help you.